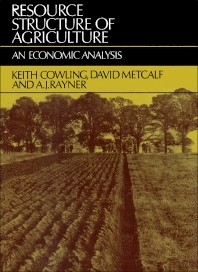 Resource Structure of Agriculture: An Economic Analysis focuses on the quantitative economic analysis of the agricultural industry. The book first discusses the theory of resource demand. Topics include decision milieu in agriculture; aggregate demand for an input; and notes on the statistical estimation of the demand function for an input. The text also examines the role of labor in agriculture, including agricultural wages, migration from agriculture, and regional labor supply. The monograph underscores the use of machineries in the agricultural sector. Analysis of post-war demand for power and machinery; early developments in agricultural mechanization; trends in the use of other machinery; and supply conditions for agricultural machinery are discussed. The text also looks at the use of fertilizers and pesticides in the agricultural sector, as well the need to invest in farm buildings. The book examines the demand for resources and supply of agricultural products. Future pattern of resource use and technological change; interactions between demands for different resources; and resource demand and a derived supply elasticity are discussed. The text is a valuable source of data for readers interested in the economic analysis of the agricultural industry.